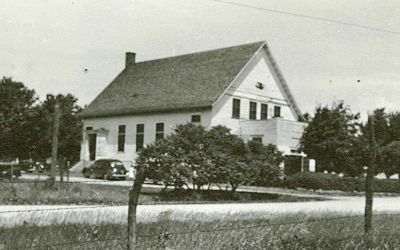 Metemora Mennonite Church in Metemora, Illinois in June 1948. Source: Mennonite Community Photograph Collection, The Congregation (HM4-134 Box 5 Folder 1 photo 010.5-10). Metamora Mennonite Church (Mennonite Church USA), originally known as the Partridge Creek or Springbay Church, was organized in 1833 by Christian Engel in the home of his son John Engel one mile west of Metamora. Christian Engel, the first Amish bishop in America west of Ohio, served as bishop of this congregation until his death in 1838. The Partridge congregation at one time had 13 ordained ministers, four of whom were bishops. Services were held in the homes until 1854, when the Partridge brick church was built, which served until 1889, when a frame building was erected one mile east of Metamora. For many years services were held every other Sunday, alternating with the Roanoke Church. The Metamora and Roanoke congregations together purchased an abandoned Baptist church building seven miles north of Eureka in 1905, rebuilt it, and called it the Harmony Church. When the Roanoke congregation built its own meetinghouse it left the Harmony work in charge of the Metamora congregation. Services were held regularly each alternate Sunday in the Metamora church. On intervening Sundays the congregation divided between the Union church near Washington, IL, and the Harmony church. In 1929 the Harmony and Union churches were closed. The Harmony building was moved to Pleasant Hill, near Morton, and was used by the congregation there as a house of worship. The membership of the Metamora congregation in 1955 was 388, with Roy Bucher as pastor and Howard J. Zehr as bishop. The congregation is a member of the Illinois Conference. H. R. Schertz (1886-1954) served as minister in 1917-1954, bishop 1941-1954, and outstanding leader of the Metamora Mennonite Church, with the exception of a period of about three years (1920-1923), when he served as superintendent of the Chicago Home Mission. In 2014 the congregation was served by Ministers Jon David Byler, Michael D. Danner, and Ada L. Nofsinger, and the congregation had a membership of 175. Hege, Christian and Christian Neff. Mennonitisches Lexikon, 4 vols. Frankfurt & Weierhof: Hege; Karlsruhe: Schneider, 1913-1967: 111, 117. Schertz, H. R. and Harold S Bender. "Metamora Mennonite Church (Metamora, Illinois, USA)." Global Anabaptist Mennonite Encyclopedia Online. 1957. Web. 23 Apr 2019. http://gameo.org/index.php?title=Metamora_Mennonite_Church_(Metamora,_Illinois,_USA)&oldid=146619. Schertz, H. R. and Harold S Bender. (1957). Metamora Mennonite Church (Metamora, Illinois, USA). Global Anabaptist Mennonite Encyclopedia Online. Retrieved 23 April 2019, from http://gameo.org/index.php?title=Metamora_Mennonite_Church_(Metamora,_Illinois,_USA)&oldid=146619.